Off the Mediterranean coast France is a group of islands once called the Stoechades by the Greeks, and from which this group of lavender derives its name. The flower heads are characterized by what look like extra petals on top of the flower head. Sometimes called rabbit ears or wings, their correct name is sterile bracts. These plants bloom throughout the summer. The foliage of L. stoechas has camphor scent. This species is a natural hybrid of L. angustifolia and L. latifolia, unfortunately all are sterile. Colors are primarily shades of violets and purples although there are a few white varieties. 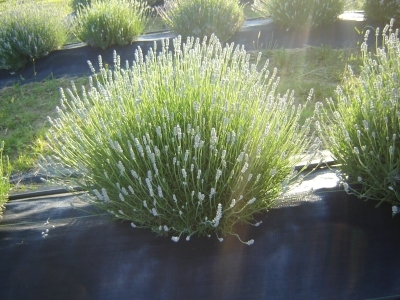 Lavandula x Intermedia hybrids have several members which are winter hardy to zone 5. Their essential oil can be five times that of L. angustifolia. They tend to bloom several weeks later than L. angustifolia and often bloom twice in the season. Many of these varieties are bred so the dried buds fall easily from the stems. This makes collecting dried buds simple. These are known as English lavenders. 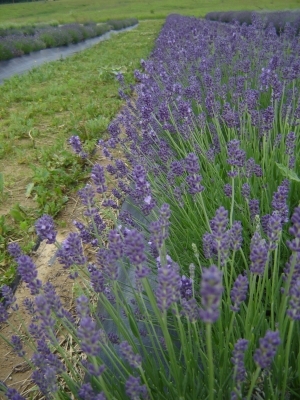 One of the largest lavender species, it contains the most winter-hardy and colorful varieties. Some are small enough for the rock garden, others large enough to make a statement! 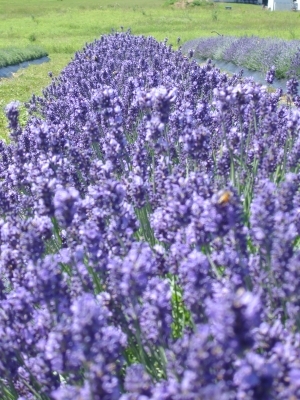 The earliest lavenders to bloom in the garden, most will bloom in June or July and again in August and September. Uses: Cut flowers, garden flowers, border flowers, ornamental plant, lavender wands, dried bundles, dried buds, sachets, essential oil. 'Grosso' was discovered in France in 1972. At the time, L x intermedia 'Abrialii' was commonly grown for oil, and being affected by disease. Someone noticed how healthy the 'Grosso' plants were, and gradually it became the popular commercial variety. Uses: Cut flower, rock garden, herb garden, edging paths, containers, essential oil, & culinary. Long spikes holding violet flowers make this plant stunning in the garden and perfect for dried vase flowers. Very large plant. Spring pruning helps keep its shape. The largest plant we have ever recorded on the farm growing to 67" in diameter in full bloom with 22" stem spikes. This variety tends to bloom late in the season up until August. 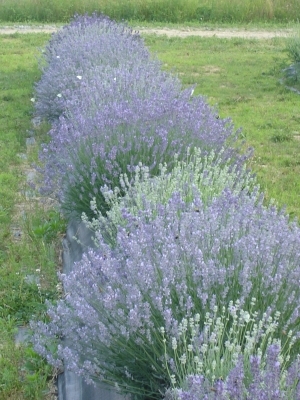 Some plants have been known to flower on only half the lavender hedge. Some do not flower at all with just a spike or two all season. Still a great large addition to the garden with a year round aroma. 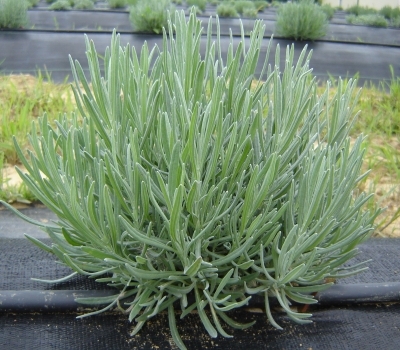 Uses: Cut flowers, garden flowers, tight lavender bundles & makes a great additioon for culinary lavender. This beautiful purple variety shows compact growth. It is pretty in bloom and hard to find. Uses: Hedge, cut flowers, garden flower, rock garden, dried flowers, and dried bundles. This beautiful pink lavender has been grown since 1937. Dried bundles are very pale with a unique sweatness. Uses: Garden, rock garden, culinary, dried buds, cut flowers. 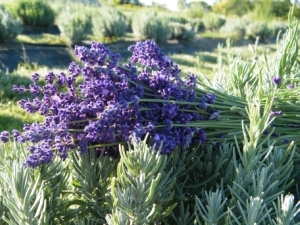 This lovely lavender is one of the newest on the market and in 1994 was an All American Selection winner. It was bred by W. Atlee Burpee and Company of the United States. 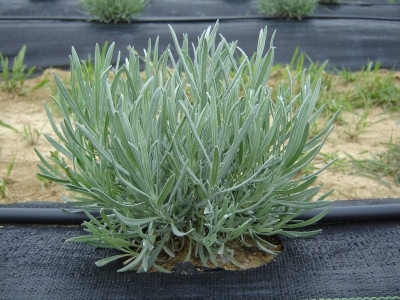 Using L. angustifolia 'Munstead,' they bred the plants until they produced lavender that would grow true to type from seed and bloom in the first year. 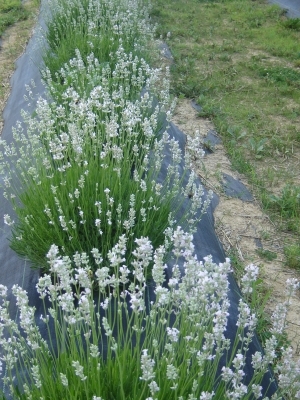 This is quite an achievement, as most lavenders, whether started as cuttings or from seed, bloom in the second year. To achieve bloom in the first year, you need to start the seed indoors in January or February. It benefits from pruning to keep its size and shape. This variety grows short and compact and is not recommended for dried bundles due to the short stems. This variety does not live long in the Midwest Zone 5. Uses: Hedge, garden, rock garden, cut flower, dried flower, dried buds, dried buds on a stalk, essential oil, culinary. A beautiful, fragrant plant which reliably blooms twice a season. The flower spikes, in color and form, are what we traditionally think of as lavender. They hold their color and scent well when dried. 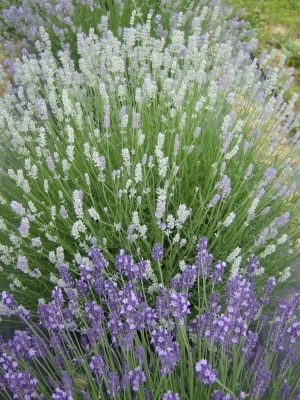 The dried buds hold to the stalk if you are looking for lavender stalks for crafts and projects. It is believed to have been raised by Major Lawrence Johnston at Hidecote Manor in Great Britain, around 1950. Uses: Cut flower, dried buds, rock gardens, garden flower, herb garden, edging paths, culinary. 'Munstead' is the most winter hardy of all the lavenders. Although shown here as winter hardy to zone 5. Grown since the early 1900's. Flowers tend to appear bunched in a group about 1" long at the top of the flower spike.